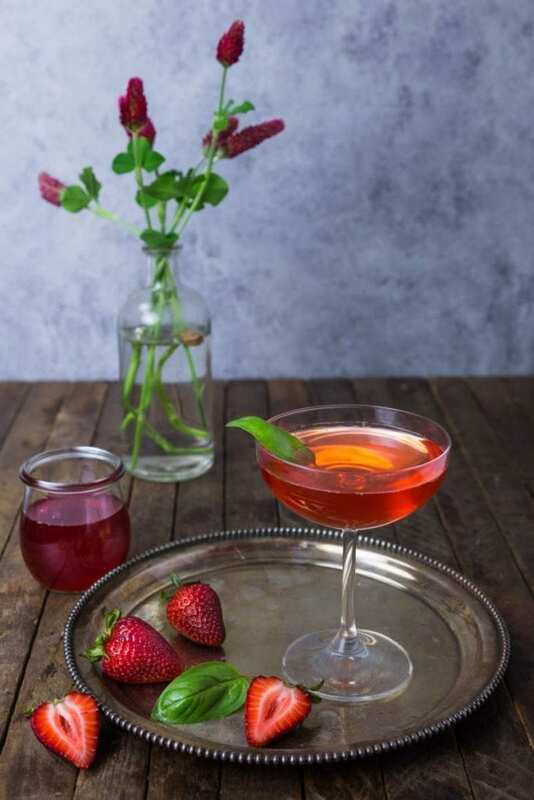 The Strawberry-Basil Martini is a beautiful and sophisticated cocktail that pairs two of our favorite summer flavors. While the combination might sound unusual, the sweet fruit and herbal notes are absolutely delicious together. It’s berry season, everyone! Sound the trumpets! Blow your kazoo! Get your strawberry costumes cleaned and pressed! 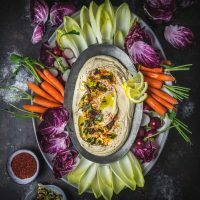 After a long, cold winter, spring always feels like a greatest hits album of produce, with one favorite coming into season right after another. Asparagus, boom! Ramps, double boom! Green garlic! Morels! Peas! And then, when we’re all warmed up … berries! Just look at this shot of our haul from the Beacon Farmer’s Market last week. I mean, seriously, things are looking up. 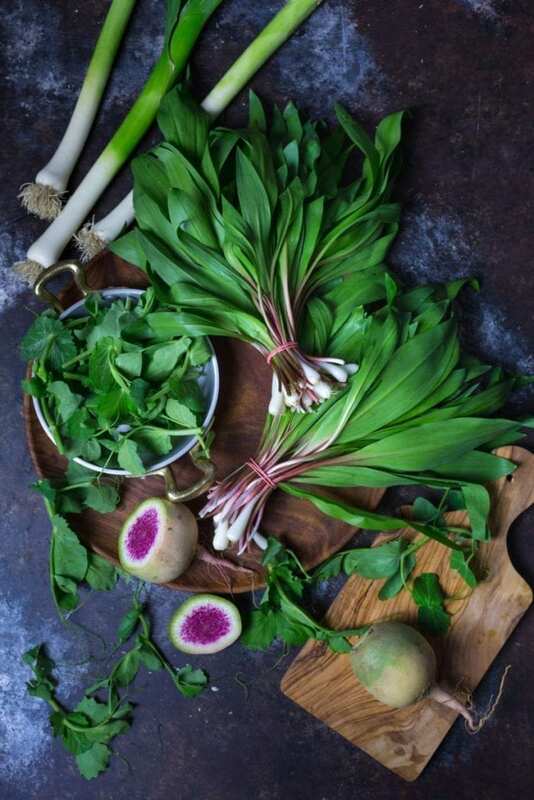 Ramps, watermelon radishes, young leeks and pea shoots. 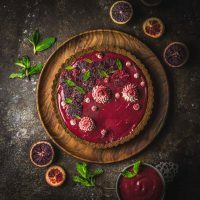 While the berries we’re growing won’t be ready for another week or two, fantastic berries are popping up at the grocery store and farmers market right now and there’s so many things we want to make with them! Seriously, you should see my recipe wish-list. 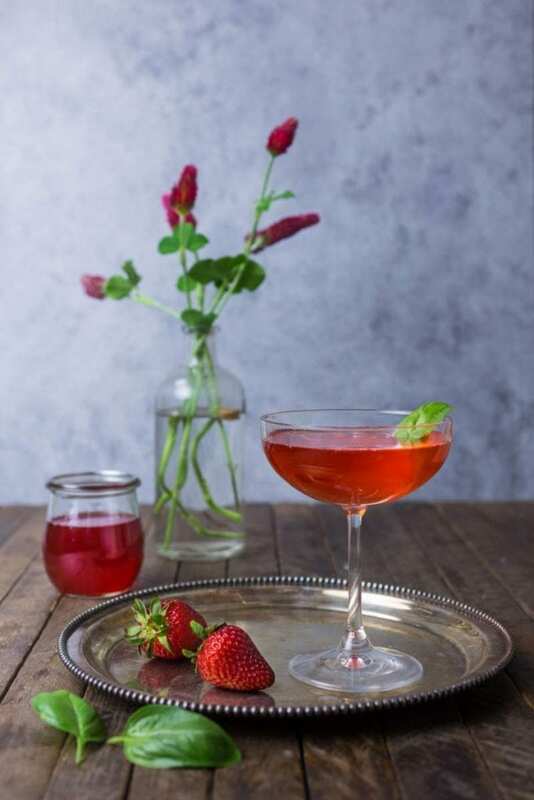 It’s one berry dish after another, but this time we decided to kick off the season with a cocktail made with fresh strawberry syrup: a Strawberry-Basil Martini. 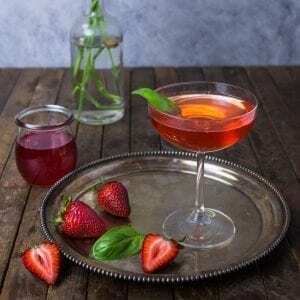 Summery and sophisticated, the Strawberry-Basil Martini is crazy good. I know it’s pretty easy to find strawberry liqueurs and strawberry-flavored vodkas, but to my palate at least, strawberry-flavored products tend to taste artificial and cloyingly sweet. Not really my thing. So instead, I thought a fresh strawberry syrup would bring both sweetness and a fresh berry flavor to our cocktail. And yes, yes it does. Making the strawberry syrup is really easy and you can prepare it way ahead of time, if you want (it will keep in the refrigerator for several weeks). The other great thing about it is that you don’t need absolutely perfect, peak-ripeness berries to make this. If your berries are a little under-ripe, no problem. Cooking the syrup will naturally bring out that perfect strawberry flavor. If your berries are a bit over-ripe, that’s fine too! No one will see them, so a few bruises and brown spots won’t be a problem (though do trim away any moldy pieces). Of course, if it’s peak strawberry season where you are, get as many as you can and make loads of syrup because this stuff is heavenly, and not just in cocktails. Drizzle it over vanilla ice cream or yogurt, add it to iced club soda for a refreshing alcohol-free drink or drizzle it into a glass of Champagne for a Bellini. Note: You will end up with about 1 1/2 cups of cooked berries when you’re done making the syrup. Don’t throw these out! They’re also delicious on yogurt or ice cream, or spread onto toast, like jam. 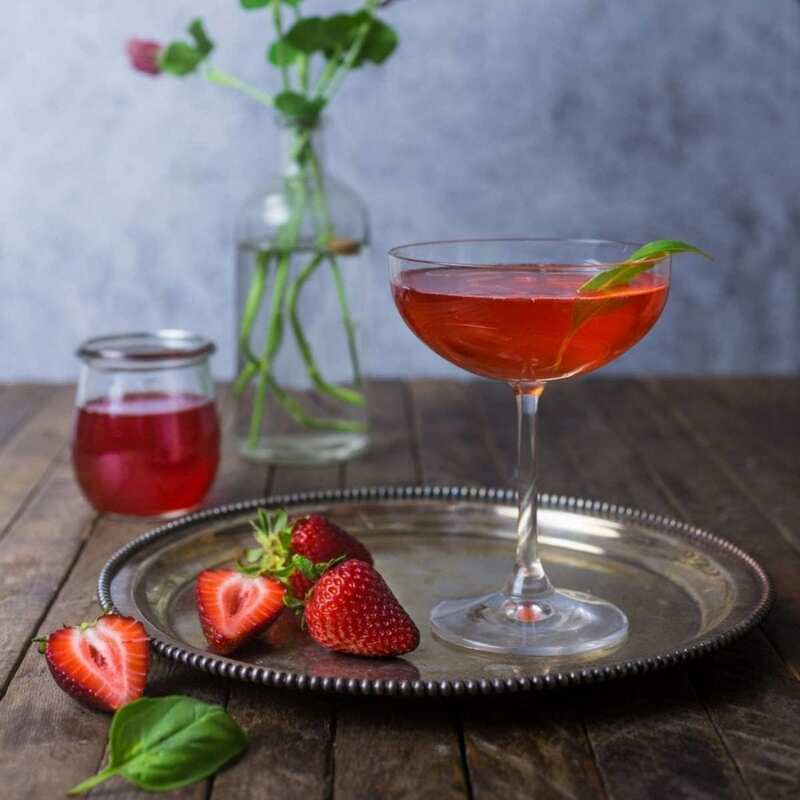 Fresh and summery, this Strawberry-Basil Martini is our new favorite. In this case, basil adds a spicy, herbal note that beautifully balances out the strawberry’s sweetness. 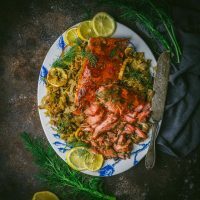 Not to sound too hoity-toity about it, but it makes what is often a one-note flavor, a lot more complex and well, grown up, for lack of a better term. We found that 4 large basil leaves, muddled in the shaker, gave us just the right balance. That way you can taste the basil, but it’s in the background. Feel free to use more basil leaves if you want a stronger herbal flavor. You can use either vodka or gin here (if using gin, try a London Dry gin like Bulldog or Hendrick’s). 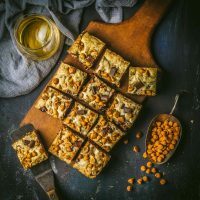 The other ingredients are Lillet Blanc, a French fortified wine and one of our favorite summer mixers, and just a little elderflower liqueur (like St Germain). A squeeze of lemon adds some tartness for balance. For the strawberry syrup: In a medium saucepan, add water, sugar and strawberries. Bring to a boil and stir until sugar dissolves, about 2 to 3 minutes. Lower heat and simmer for 10 minutes, occasionally skimming off any foam that forms on the surface. Pour liquid through a fine mesh strainer set over a heat-proof bowl and allow liquid to drain on it’s own. Don’t press down or the syrup will be cloudy. Cool to room temperature and transfer to a clean glass jar. Chill until ready to use. For one cocktail: Add basil leaves to a shaker and gently bash a few times with a muddler or the bottom of a wooden spoon. Fill shaker with ice and add all the other ingredients. Shake hard for 10 to 15 seconds. Double strain into a chilled martini glass, float a basil leaf on top and serve.